A2 Website Builder is an easy to use graphical website builder that allows you to build professional looking websites without coding. These instructions tell you how to get started using the A2 Website Builder. If you purchased the A2 Website Builder with a hosting package. If you are trying the A2 Website Builder before you purchase. Getting your site on the web. In cPanel, locate the Software section and click the A2 Website Builder icon. On the A2 Website Builder page, click the Create Site button. After activation, additional controls are shown. To begin creating your site, click the login button. After clicking the login button you are transferred to the website builder. The website builder will allow you to pick a theme, edit every part of the page and even add a blog or ecommerce feature. For complete instructions click the question mark icon at the left of the screen. 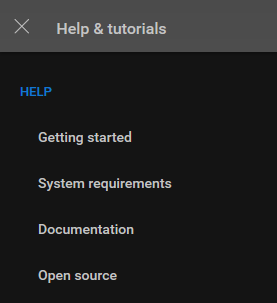 A help menu is displayed offering everything from animated getting started instructions to all the licenses for open source software used in creating the website builder. Click the X at the upper left of the Help Menu to close it. When you are finished designing your site you can preview or publish it using the buttons in the upper right corner of the editor. The trial version of A2 Website Builder includes one page and lasts only 14 days. To upgrade A2 Website Builder to more pages, and features, click the up arrow icon in the lower left of the builder. A2 Website Builder assigns a temporary site name so you can see your site as you work on it. When you have finished creating your site, use the following steps to assign your domain name to it. The following instructions assume that your domain's DNS is managed by A2 Hosting nameservers. For details about setting up nameservers, see this article. On the A2 Website Builder page click Manage. On the next page, select your domain from the Map Domain listbox. Click the Map button to map the domain. Click Make Primary next to the actual domain to move the site over to to the primary domain. In a short time your site will be visible at your domain.